The home of Vietnamese water puppetry, Kim Megson makes the short trip to Chua Thay Pagoda, a 900-year-old shrine to the monk Tu Dao Hanh. Not so long ago I found myself in need of a day away from the noise and commotion of Hanoi. I asked around for recommendations for somewhere interesting to spend a few hours; a quiet place a bit off the beaten track. Talking to my Vietnamese friends it would seem that there are thousands of such destinations around Hanoi, each more unmissable than the last. After some deliberation, I settled on a trip to the 900-year-old Chua Thay Pagoda. Although well-known locally, it’s yet to be widely discovered by the country’s foreign population. 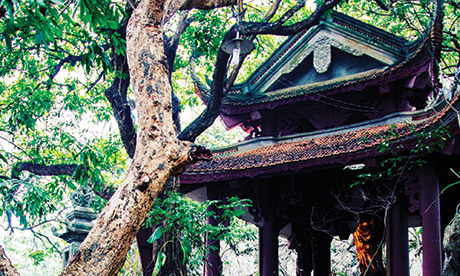 I was told that the place was peaceful, historical and a little quirky — the perfect mix for a Vietnamese day trip. The drive to Chua Thay, a 30km or so motorbike ride down the dusty and bleak Thang Long highway, doesn’t offer a great incentive to make the trip, especially on a chilly Hanoi day (although an elusive but apparently existent bus is said to head in that direction from Kim Ma). The destination ultimately rewards hardy travellers as it both lives up to its promise and still manages a surprise or two. Lying at the foot of Sai Son Mountain in Quoc Oai District, the surrounding scenery is reminiscent of Ninh Binh, with the same rocky and forested outcrops looming out of the misty haze. The surrounding town, on a sunny day, is what the term ‘picture postcard’ was made for, but be warned — it looks a little less enchanting on an overcast afternoon. Chua Thay comprises of three buildings located parallel to each other. The main pagoda is the biggest, and lies in front of a large and still lake, with the two smaller temples to either side. Water puppetry hails from this part of the country, and performances take place on the water here at certain times of the year. Houses with colourful front doors surround the lake, and alongside the ancient buildings they look like they belong in a film set — perhaps a Buddhist reimagining of Lord of the Rings. In summertime monks live and study in the pagoda, waking up daily at 4am to pray. In the winter it is often deserted, except during Tet, when people come to worship here and see the pagoda, which has long been the subject of art, song and traditional legends. The figure behind all this is Tu Dao Hanh, a monk who lived in the area during the 11th Century. According to legend, Hanh was a humble and generous man who was very giving to the poor. He invented water puppetry to mark the lives of the rural population. Before his death he told the monks that he would die in the mountains and requested that if his remains begin to smell and decompose he should be left there, but if instead they should give off a nice aroma then his body should be taken to Chua Thay and be preserved — it is said that the remains of Hanh are still entombed in Chua Thay. He was later regarded as a saint, and Buddhists believe he was reincarnated first as a teacher and then later as a king from the Ly Dynasty (who repopularised puppetry to celebrate). Statues of the three incarnations can be seen in the pagoda. One reincarnation of a soul into another human body is very unusual in Buddhism, and two is remarkable. So this story is believed to show just how saintly Hanh was; Chua Thay even goes by the name Thien Phuc Tu, or ‘Pagoda of the Heavenly Blessing’. Having explored the pagoda at length with its imposing statues and shrines sat atop the usual offerings of choco pies and Vietnamese snacks, I ventured into the cold and braved a climb up the steep mountain steps to explore another temple higher up, sat above a huge cave. Aggressive roosters strutted along the rocks, their feathers flying around madly as they fought each other, occasionally tumbling into my path. Adventurous visitors should take a look inside the large cave, which is said to contain the bones of Vietnamese soldiers who fought in the American War. This should only be attempted on a dry day though, as access is via steep rocks which are treacherous after rain. Tours of the pagoda and mountain can be arranged in the town below, and will provide a more thorough explanation of the pagoda’s unique history and importance. If you can speak some Vietnamese it is also interesting to stop and have a chat with the head monk, who is happy to share information about its history and the lives of Tu Dao Hanh. A visit to Chua Thay provides a refreshing escape from the bustle of Hanoi and helps broaden cultural horizons, too. It offers something memorable and a little different, and is guaranteed to inspire further day trips to some of Hanoi’s ‘thousands’ of lesser known places of interest. Follow Nguyen Chi Thanh and then Tran Duy Hung until you get to the Thang Long Highway heading out to Hoa Lac. Travel down the highway for about 20km. The turning off to Chua Thay is on the right hand side close to Quoc Oai.